Even though some people are satisfied with slight changes to their faces, others prefer a full face or full body makeover. After all, traveling all the way to Korea for a single botox filler is less worth it than diving into the deep end, and getting a full transformation. The above mentioned traits are not only the latest Korean plastic surgery trends, but they are also considered to be a beauty trend that has permeated throughout Asia and is here to stay. In the first part of this series, we shall look at Vietnamese celebrities who have gone through various surgeries to achieve this beauty standard. This can be evidently seen in other Asian celebrities, besides Korean stars. These four Vietnamese celebrities have all undergone drastic changes in their appearances in just a few years. The observant eye knows that these changes can only be done through superior plastic surgery. Phuong Trinh showed up to a promotional event with a much more defined nose that shone in harmonious proportions with the rest of her face. She then stated matter-of-factly that she had undergone surgery. Teen singer Bao Anh was another such case, though she did not admit to having done any work on her breasts. From pictures of before and after shots, however, it is unclear whether breast augmentation surgery was done here. Whatever it is, she looks stunning and is also following the latest Asian beauty trends. Once holding a cute, roundish face, the runner-up of Vietnam’s Next Top Model 2011, Tra My has abandoned her youthful innocence for a sophisticated and classy appearance. Now, higher cheekbones, a straighter nose and a sharper jawline can be seen in her latest photos. Similarly, a lot of young and old women alike are following this trend; opting for Asian rhinoplasty, jawline surgery, and cheekbone augmentation. Finally, there is the TV host and actress, Quynh Chi. Her successful acting career did not save her from the critical eye of the public. Soon she began to doubt her own beauty and it is said that not long after, the appearance of her nose and chin has changed as well. Though subtle, the changes from surgery has yielded dramatic results for these ladies. What all of them have in common is the fact that they are all following the latest beauty trends in Asia, and they manage to pull it off very well too! However, anyone bedazzled by these results may want to consider this: what’s popular may not be suited for your overall face. Unless you were to opt for a full face makeover, it may be tedious and unsuitable to just follow these trends. For a beautiful but harmonious and overall proportionate look, these procedures should complement your natural looks. To avoid such cases, discuss with your surgeon about your individual case before getting any cosmetic surgery work done. While it is not known where exactly these beautiful Vietnamese celebrities have gotten their surgery work done, it is likely that they had gotten it in Korea. One of the biggest reasons is because Korean plastic surgery is relatively inexpensive for the value it delivers. Even though cosmetic surgery is fairly cheap in say, Thailand, not all of the cosmetic surgery practices in Thailand is regulated. Furthermore, a vast majority of Korean clinics have to be properly licensed first, to prove their expertise and professionalism. Therefore, you can expect quality service and getting the value for your money at one of these licensed clinics where some of the best Korean surgeons are at work. Also, Seoul TouchUp recommends that customers choose clinics and practices that offer surgeries within the average price range. Too high a price, and you might be getting ripped off, too low a price and you might risk getting a disastrous result. What is the average price range, many customers ask. Over at our Korean plastic surgery costs page, there is a table that will answer that question. For many customers, a big reason to visit Korea besides surgery is for a pleasant and relaxing vacation. From harbouring some of Asia’s best shopping destinations, beauty emporiums, jijimbangs, to a good bargain at various markets, to food stalls and high end restaurants. There is a lot there Seoul has to offer for those with a thirst for adventure or a pamperhouseDespite Gangnam Street’s immense popularity as a hot tourist spot, it is jam packed with a variety of clinics to choose from which can leave many to feel bewildered. Which to choose? Which is a licensed clinic? Which is reputable and respected? Which is a scam? Where is the best clinic for this particular surgery? Who is the best surgeon around to get this procedure done? Where can one get the best value for their money? These questions will rise up as you plan for your cosmetic surgery trip. With an overabundance of options, it might be a bit of a problem to narrow down the very best choices. Luckily, there is now more than enough information to navigate your way around Seoul and your plastic surgery journey. Firstly, there is an English-speaking Korean plastic surgery forum at your fingertips with direct responses from the experts. Secondly, many people have documented their Korean cosmetic surgery journeys on their online journals outlining everything from the onset of surgery, to before and after care, to their final results. Lastly, you will not be alone if you do not wish to navigate around a big foreign country all by yourself. With government approved tourism agencies such as Seoul TouchUp, you can expect a guidance and a safe, easy, hassle-free trip. In the next part of this series, “Asian Celebrities and Cosmetic Surgery Trends”, we’ll be looking at Singaporean celebrities who have admitted to plastic surgery. 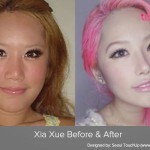 They, too, have followed the Asian beauty trend that arose from K-POP and Korean celebrities. To find out which Singaporean celebrity follows the latest Asian beauty trends, stay tuned for the next part of this series!